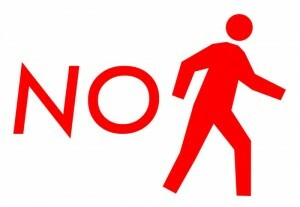 As I was reading Fred’s post on “saying no” the other day, I was contemplating just how hard it can be to say “no.” While most entrepreneurs take it in stride, I’ve had some that just look absolutely crestfallen (man, that feels awful), I’ve had others argue with me telling me how dumb I am (which doesn’t feel so awful), and I’ve had folks that address my reasoning telling me that they’d be happy to make whatever changes I think they need to make to the business as long as I cut a check (which is scary on many levels). The one thing I still don’t have a handle on is the quick no. I know of investors who will schedule an hour meeting and ten minutes into it will tell the entrepreneur there is clearly no fit and will hustle them out of the office. I have a couple of problems with this model. First, even though I often think I know ten minutes into a conversation if the deal is interesting or not, there have been a few times where pitches that started out poorly ended up really winning me over. I would have hated to miss those. Even more problematic for me, though, is that it just feels rude. Yes, time is my most precious commodity and yes, it can be excruciating to sit through a presentation I know I will never fund. But if I have committed my time and the entrepreneur has taken the time to prepare a presentation, round up a team, and travel to the meeting, well, they deserve to be heard and to have a conversation about it. Heck, if nothing else, maybe I can give them a little food for thought while learning something new myself, and then introduce them to someone who may be able to help. Again with the derisive laughter and a “I can’t believe you asked me that question.” He then went on to say that if were asking a question as vapid as that we had nothing else to talk about and he hung up. Made me feel really good about my already conceived notion that we were not going to fund this guy. And the bonus was that I wasn’t going to have to tell him why. Rob – I think your instincts are right, both from the politeness angle you cite, but also from a reputational perspective. Even before sites like TheFunded, the entrepreneurial community has had a tendency to share notes, and there’s no real advantage in saving a half hour if the unintended consequence is an angry founder. You never know who that founder will talk to a week later, and perhaps of equal measure, you never know if that founder will launch a business a few years later that you really *do* want to fund. My mentor at Updata, Rich Erickson, taught me that you always shoot straight with entrepreneurs (Rich is very upfront at the end of a meeting if he’s not interested or has concerns) but at the same time, as you write, show respect for the effort they’ve expended and listen to the pitch and try to add value even if the business is a poor fit for your investment thesis. Having been there as an entrepreneur, the fundraising dance is painful, but makes a lot of sense from both parties, especially if everyone is honest and patient about what they want to see. As Andreessen says, if you want to be entrepreneur, get used to getting told no — a lot. In our case, lots of people told us “no” or “not yet”, including an eventual series A investor. I have to underscore how much value those entrepreneurs who you spend the extra 50 minutes beyond your internal “no” may get from you. Of course, if they’re open-minded. When I was fundraising the first time those meetings provided the fire hose of learning that I needed. Now, it could be that this guy (or girl, but my guess is “guy”) is extremely arrogant. And who knows, he/she may make a good amount of money. Some old timers may be able to tell similar stories about Steve Jobs. . . But I do think in the funder/fundee dance, be it profit or non-profit, there can arise “fatigue” that sets in on both sides, from the “buyer” being pitched or the “seller” pitching. While I have no idea what personalities types generally make the most money, I am quite certain your approach Rob is best for sleeping at night. Also, when we met Rob, that extra 50 minutes you spent after you were clearly not interested was extremely helpful . . .
good post. You can tell it through your instinct. Best way to give them an option that if you can’t help, maybe someone will. Sometimes, its hard to say NO but when you think you’re right, why not? As a first-time entrepreneur and someone who is currently forming a strategy to raise a Series A round…I must say it is incredibly refreshing to read this blog post. I have heard awful stories from people (on both sides) and 100% of the time, ego is to blame. Great post, Rob. 5 years late on this post. I wonder what has happened since then Did you follow your own path or that of other VCs? If you are human first, it pays off later on in ways you can’t ever calculate in the moment.